The Mega Bloks package could not have arrived at a more opportune time to be enjoyed to the fullest at my house. My family has been living for more than 3 weeks with minimal household items and toys while we wait to move into our next house — so the boys felt like it was Christmas in May to receive a fun Thomas & Friends Busy Day at the Quarry (ages 3 and up) buildable playset for their review. My 7-year-old immediately set out to work building the playset, while my 3 and 1 year olds patiently waited while playing with Thomas and Mavis. 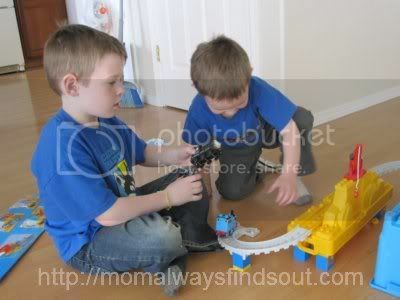 They love playing with Thomas & Friends train engines, and the Mega Bloks trains are fun because they can be taken apart block by block and rebuilt. Once the quarry playset was built, the boys spent the entire afternoon playing with it, driving the trains on the track and filling the bins with coal! My 3-year-old continues to go back and play with the set all by himself and has since spent hours playing with the trains and using the fun crane. There are a few smaller pieces I have to watch out for if my 1 year old is playing along – but note that this toy is appropriately aged by the manufacturer for children ages 3 and up. My boys give the Thomas & Friends Busy Day at the Quarry playset a perfectly fun 5 Star Rating! Thomas & Friends fans will love these Mega Bloks and enjoy hours of constructive entertainment. Something I really appreciated about this set is that when the kids were finished playing, the set comes apart and all the pieces store inside the bin compartment. It is a nice way to keep all the parts to the set together without having to buy a separate storage container. *It lets children build and rebuild for hours of endless play – it builds up to 4 feet long! *You can use the included storage bucket to climb and race Thomas and Mavis down ramps. 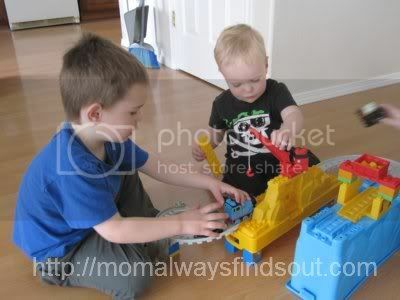 *The buildable playset includes Thomas and Mavis, coal and chute, building blocks and ramps and a real-working crane! *The Thomas & Friends Busy Day at the Quarry approximate retail value is $29.99 and is available at Wal-Mart in the US and Canada (and online), Target (and online), Toys “R” Us in the US and Canada (and online), and Amazon.com. *For more information about Mega Bloks and Thomas & Friends buildable playsets, visit the Mega Brands website. *To sign up, visit the Family Club at Mega Bloks. 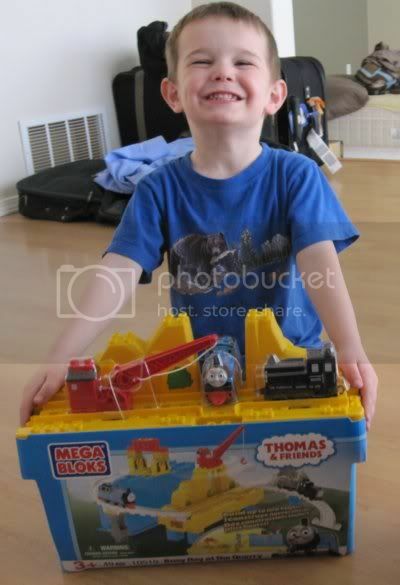 My family would like to thank Mega Bloks for allowing us to review their wonderful Thomas & Friends products! 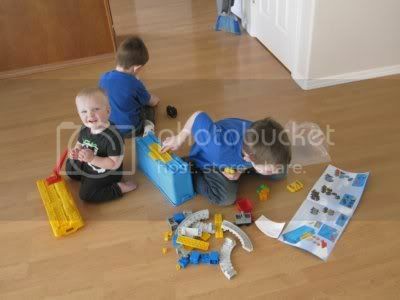 We had a great time and will enjoy our Mega Bloks toys for many more hours to come. Disclaimer: I received a Mega Bloks Thomas & Friends Busy Day at the Quarry playset free of charge in exchange for this review post. All opinions expressed are honest and my own, based on personal experiences with the product.